We help you build a smarter digital supply chain. 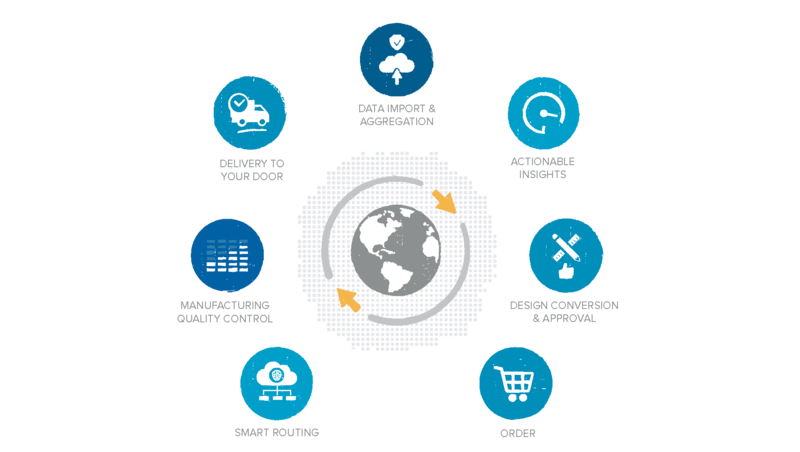 Our end-to-end service makes it possible to digitize and streamline your supply chain. Instead of mass-producing parts, then warehousing and transporting them, 3D printing and related advanced manufacturing techniques allow you to produce parts on-demand and closer to the end user. This increases flexibility and speed in your product lifecycle. It improves your environmental footprint and helps you save costs on materials, logistics and stock keeping units (SKUs). Before you get started, identifying, ranking and selecting the right parts is crucial. Our expertise and software help you do that. We provide a thorough analysis which will help you identify how additive manufacturing can optimize your supply chain. Once you’ve selected the right parts, we’ll make sure they are print-ready and assign their production to the Additive Manufacturing Partner in our network that best matches your needs and specifications. First, we aggregate data from various sources to run advanced analytics and accelerate part identification. Your data is safe with us. Our software is engineered to protect your intellectual property and meet the industry’s highest security standards. Visualize and evaluate supply chain data (e.g. minimum order quantities, stock locations, etc) as well as technical information (e.g. materials, technical dimensions, and tolerance, among other data points) to make the most informed decisions and determine which parts are eligible for Additive Manufacturing. Within our platform, a seamless collaboration tool supports the design conversion and internal review process. After this, we send you a sample for approval. We also provide reverse engineering, 3D scanning and re-engineering services to customers who need to adjust their designs or create them from scratch. As soon as a part is approved for on demand manufacturing, authorized users in your team can easily place, track and report on orders. Repeating orders and ordering small series from your virtual stock library is seamlessly done with the click of a button. We have institutionalized quality assurance in our partner selection process and in the manufacturing of each part. All of our Additive Manufacturing Partners are compliant with the ISO9001 standard. We also perform regular audits to ensure consistency and reliability in every order. Through our global network of Additive Manufacturing Partners, you can get the ordered part anywhere in the world. Ready to get these results? Our customers saved up to 30% in costs by 3D printing small series.